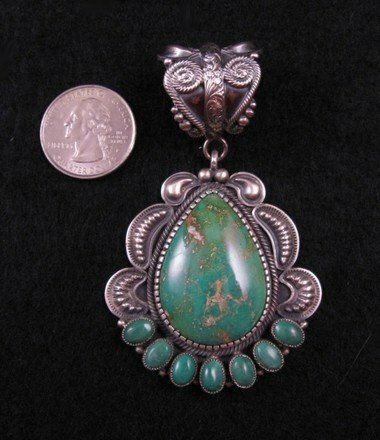 This top-quality sterling silver & green Pilot Mountain turquoise pendant was created by the Navajo silversmith, Kirk Smith, deceased. 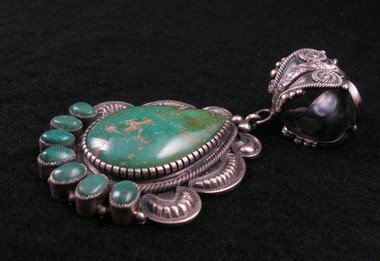 Kirk Smith's work is considered collector and investment quality and every Native American jewelry collection should include a piece or two of Kirk Smith jewelry! 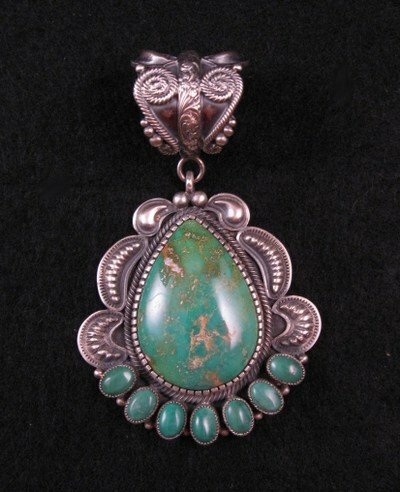 This extra large pendant has a high-grade Pilot Mountain turquoise stone that has been perfectly polished and set in a fancy hand-cut bezel, surrounded with superb silver work, and accented with seven oval turquoise cabachons across the bottom of the pendant. The turquoise stones are more green than blue in color, with light sandy brown matrices. 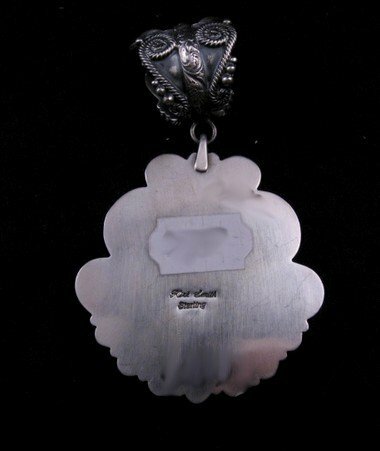 The 2-1/2 long pendant is attached to an extra large silver bale covered in fancy silverwork, large enough to handle beads or a necklace up to 5/8 diameter. The pendant and bale reach a total combined length of 3-1/4. It is 2 wide at the widest point and weighs 48.5 grams. Brand new in perfect condition. Stamped sterling and has Kirk Smith's hallmark. Certificate of Authenticity included and gift box included. Kirk Smith passed away in September of 2012. Kirk Smith's work is considered collector and investment quality. Don't miss your chance to add some of his fine jewelry to your Native American Indian jewelry collection.